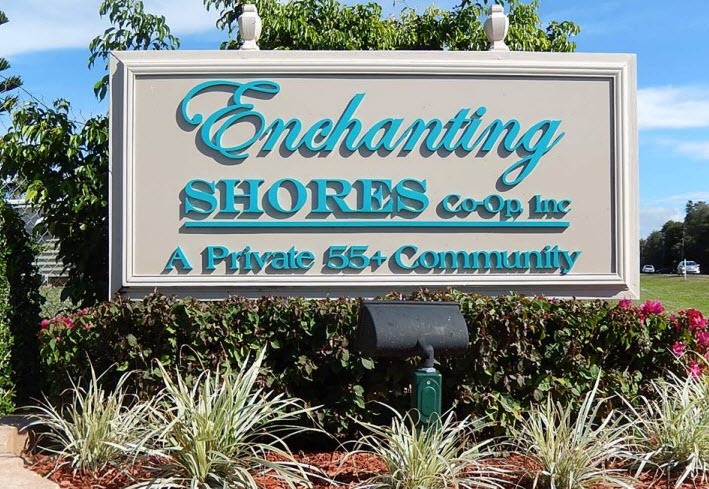 Enchanting Shores is an ACTIVE adult Co-Op community (over 55). There’s also a Fish Club that meets regularly and hosts their famous annual Fish Fry in January. Other special events held throughout the season include pancake breakfasts, dances, musical shows, hot dog lunches, spaghetti dinner, potluck suppers, and ladies luncheons. Click on the “Calendar” tab above for dates and times for each monthly activity/event. Enchanting Shores also publishes a monthly newsletter – Shorelines – from December to March. Here you can find reports from the Park Manager and President, along with Club News, Current Events, and other general information about our community. Click on the “Shorelines” tab above to view current and past publications. Enchanting Shores is bordered on one side by Henderson Creek, which - like Enchanting Shores - is within the boundaries of the protected area of Rookery Bay. Most of the homes bordering the creek have a dock. Residents of Enchanting Shores can also put their boats in at the community boat ramp at the upper end of the creek for a fishing/pleasure trip. Keewaydin Island, at the entrance to the gulf, is a popular destination. The only way to get there is by boat.